There's something a little bizarre about seeing a cutesy, fake ambulance on the weekend of 9/11's 10-year anniversary, down the street from a live police check point set-up for the latest terror threat and across the street from the heavy security at Lincoln Center for Fashion Week. Then again, maybe that's over-sensitive. 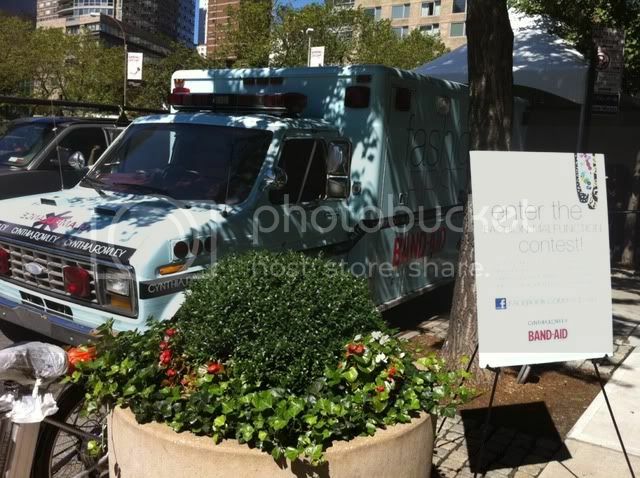 What do you think about Band-Aid's ambulance activation for Fashion Week? Despite the curious choice of timing, Band-Aid and Cynthia Rowley definitely get some creativity points for what is being dubbed the 'Glambulance.' The promotion, which is parked across the street from the site of Mercedes-Benz Fashion Week, is intended to promote a new joint venture between Johnson and Johnson and fashion designer Cynthia Rowley around the launch of BAND-AID Brand by Cynthia Rowley Adhesive Bandages, which will hit nationwide mass retailers around the holidays. The mobile campaign includes a hairstylist, makeup artist and Rowley's new first-aid kits.